Probably the most often purchased piece of equipment for any DSLR owner (next to data storage cards) has to be lenses. They are also among the most expensive items you can buy for your photographic craft. During the period of my career when I owned 3 camera shops, I was always intrigued by the lens choices my customers made. Eventually my interest in these decisions developed into a well practiced, educational, over-the-counter discussion which I made a point of having with anyone making their first interchangeable lens decision. Well over three-quarters of my first time lens buyers would ask FIRST about telephoto or long zoom lenses. To this day, I find the preference for a telephoto lens as a first purchase interesting. To my way of thinking and based on the photography challenges I faced as a professional, a telephoto or long zoom lens is not a high priority. Think about the types of photography you encounter. Birthdays, weddings, family gatherings, award ceremonies, baby's first steps with mom holding child's hand, etc. In most cases, the event takes place in a confined space with lots of people in attendance. The challenge is to get all of the people or landscape into a single picture. Knowing that the majority of the pictures I will shoot fall into this category, I would FIRST buy a wide angle (fixed or zoom) lens. Granted there are those whose photographic specialty is taking individual people portraits or images of that deer on the ridge that's over a mile away where telephoto and long zoom lenses are a necessity. But they too have families and similar space confining events to cover. A "normal" lens usually falls in the 50mm to 58mm focal length range. This lens "sees" about the same amount of a scene as your own eye -- excluding your peripheral vision. A telephoto lens (usually lenses with a focal length longer than 58mm) makes objects appear closer, but "sees" less of the overall scene. A wide angle lens (usually any lens with a focal length less than 50mm) makes objects appear farther away, but it "sees" MORE of the overall scene. FYI: a lens with a focal length of approximately 21mm "sees" about what your eyes see -- including your peripheral vision. Not too many years ago, zoom lenses were the scourge of the professional photographic community. These lenses were notorious for their optical imperfections (aberrations). However, lens manufacturers, their tools and their techniques have come a long way to make modern zoom lenses a viable and often preferred choice for even the most discriminating photographer. In fact, whether it's a fixed focal length lens or a zoom lens, you can rest safe in the knowledge that if you purchase a lens from a major manufacturer, you'll have a good chunk of glass that will take outstanding pictures. So, my tip. I would start my lens collection with a wide angle zoom lens and make my next purchase a telephoto zoom lens. 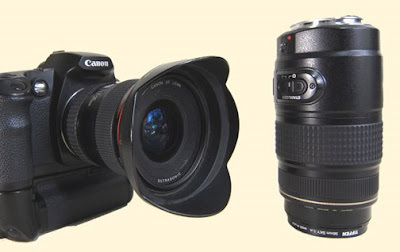 Shown here is my Canon wide angle zoom lens (attached to camera) and my telephoto zoom lens. These are my photographic workhorses. I have a similar selection of lenses for my Nikon system. With these lenses I am assured of having the right focal length for 98% of my shooting situations. With only these two lenses in my camera bag, my total focal length range is 17mm to 300mm. There is one more reason I recommend this type of lens combination. Less stuff to carry around. Instead of having ten fixed focal length lenses in my camera bag, I only have two. This makes bag searching quicker and lots less weight to carry in the field. I hope you find this tip helpful. Again, visit www.hubbardcamera.com for more "techie" (but still beginner's) overview of DSLR camera lenses. As always let me know if you have questions, comments or suggestions.